The sequence of vibrations that a vibrating object initiates is called sound. Vibration movement is necessary for voice to occur. Vibration is the rapid movement of an object back and forth. The organs that are important in the formation of human voice at first are the larynx (larynx) and the lung; The structure which has the most important role in the production of voice is the vocal cord and it is placed in a horizontal position in our throat in such a way as to form a “V” shape. Sound is produced during the breathing. When we breathe, our voices are turned on and when we breathe, when we are going to make a sound, our voices are turned off and vibrated. The raw sound produced by the vibration of the voices creates the phase of phonation (sound production). The number of vibrations of a voice technician in a second is different in man, woman and baby. This number of vibrations is about 100-150 Hz for men and 200-250 Hz for females. The raw sound is shaped by the throat, the nose and the mouth, and the final tone is formed. Voice disturbances arise during impairments affecting the stages we do. Sudden onset of upper respiratory tract infections, incorrect and more forced use of voice, high-dose chemical vapor and exposure to cigarette smoke can be among the causes of acute onset episodes. – Paralysis resulting from the nerves that enable movement of the voice tongs is a cause of chronic voice disorders. 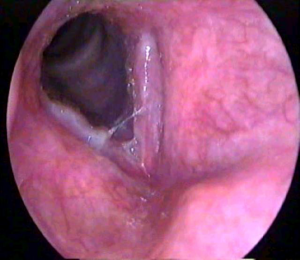 If the voice affliction lasts more than two weeks and there is pain, coughing blood, swallowing difficulty, shortness of breath, swelling in the forehead, complete loss of sound that lasts for several days or severe change in the stomach and a certain cause Or you should be examined by an ENT specialist. Problems with sound should ideally be assessed and treated by a professional team dealing with sound-related functions and problems. Such a team includes experts in ENT, voice and conversation pathology, music-singing-diction teachers. 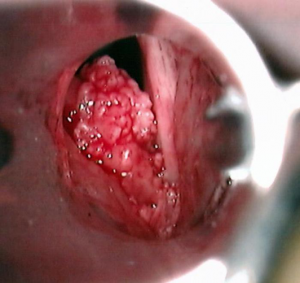 A patient who is referred to a doctor for voice, anesthesia is first performed a complete ENT examination and will attempt to see the patient with an optic device called an endoscope, which is especially held in the mouth or held in the mouth. If necessary, the images obtained during these processes will be recorded on a video tape and stored for later review. These methods are not very difficult for the patient and most of the patients are easy to adjust to the examination. These examinations are sufficient for the diagnosis of most disorders. Rarely, advanced imaging methods such as lung, sinus films and ultrasound, computed tomography (CT), magnetic resonance imaging (MR), stroboscopy may be desirable. The treatment of voice disorders varies according to the cause of voice disturbances. Most situations that cause voice misalignment improve voice habit and proper voice use habit. Medical treatment may be needed for the treatment of phonophobia-related hoarseness. It is necessary to remove the irritation in cases where irritation occurs in the tract, reflux-reducing measures in reflux patients and medical treatment if necessary. Those with pulmonary disease should consult a psychiatrist if they have psychogenic vocalizations. Apart from these, surgical treatment may be needed for sesamoid nodules, polyps, cysts and tumors. We generally feel the need to cough like throat to prevent tickling or to clear the current secretions. However, this movement is a very violent blowing of your voice and your nose is swallowing. Also if you can not give up your throat cleansing movement, do it in the quietest way. Thus, you will have the least loss to the sound of the voice. It is also useful to stretch to loosen the throat and drink some water. Continuous and severe coughing causes the voice of your tongue to break down and swell. Shouting is very disgusting for voice lines and should never be done except in emergency situations. People have a certain range of pitches and normally make up 70% of their speech in this range. It is extremely unfavorable to get outside the boundaries of this area without having been trained. In the same way, do not speak whispering to protect your voice. Instead, speak in a low voice. Talking without adequate respiratory support requires additional muscle use and reduces voice activity. For this reason, try to find out how many words you can say to a nefes during your speaking. If you do not talk long, split your cues and take a new breathe in the right place. Remember, for a natural and beautiful sound, vocalists should be vibrated as well as strong and accurate breathing support. Talking in noisy places causes sound fatigue, pain in the throat, and voice trouble. Be sure to talk a little less in such environments. The negative effects of cigarette on the throat, larynx and lung tissues are all well known. Initially, inflammation and swelling develop in these tissues. As the cigarette continues, these pathological changes go back to the formation of ‘cancer’. Continuous alcohol use results in narrow blood vessels on the voice lines and voice annoyance occurs. For a healthy sound, the body and the voices need plenty of liquid. Dryness leads to irritation and swelling of the vocal tractors. At least 8 glasses of water a day should be drunk. If your urine has a light color that is close to the color of the buzzard, the amount of water in your body is enough. – Stress can cause damage to sound pads causing the voice to be difficult to use. Relaxation techniques can improve your voice. It can provide more effective and longer speech. Try to relax your shoulder, neck and facial muscles periodically. Breathe in slowly and deeply. Reduce the tension in your throat and your throat by doing regular exercises. – Allergy and antihistamines taken in colds cause dryness in vocal tracts. When using such medicines, plenty of water and liquid foods should be taken. – Do not lift heavy loads, push or pull. – Be careful not to catch an upper respiratory tract infection such as a cold or flu. Keep the body resistance high for this. – Do not consume a lot of coffee and tea. – Do not use menthol or anesthetic throat pastilles. – If you are earning your life using your voice, do voice and cool sound exercises every day. – If the voice pause lasts more than 2 weeks, this can be a sign of a serious voice disorder. Absolutely refer to an ENT Disease Specialist. – Burning in the chest, bitter taste in the throat, feeling of sourness or frequent belching may be caused by stomach acid rising up the food intake and irritating the throat. If you have these complaints, avoid spicy, spicy, sour, acidic foods. After meals take some antacids, sleep with a full stomach and lift the head of your bed from the waistline if necessary. – Avoid phone calls. Speak as little as possible. Think carefully, decide what you want to say and start talking like that. Do not forget to breathe while you start talking. Avoid long sentences and start breathing each new sentence. When you breathe, do not move your shoulders or your rib cage. Do not breathe too deep to talk, you just feel that you’re filled. Speak out by extending vowel letters. Do not use space-filling voices such as ‘aaa’ or ‘eee’ during a conversation. Decrease speech speed. If you feel your voice is tired, stop talking. Do not start chatting. – Avoid using aspirin-like painkillers. Especially women should pay more attention to this during masturbation periods. Do not use unnecessary medications that are known to facilitate this kind of bleeding and also known as ‘blood thinners’. – If necessary, keep pencils and paper to communicate without talking. – If you feel uncomfortable in your voice, relax your voice. – Perform strict or partial sound rest.